It seems something very useful and easy; your own personal camera hanging above you, so you and your buddies get filmed on the water. But it is a bit more complicated and compromised as you probably would expect. Tracer Sky Mount. The red parts need to be glued into place according to your kite’s dimension. The product video of the Tracer Mount is al shining happiness and above all quick and easy to use. We went out with the mount and tested it. Easy, quick and useful where not the first words that popped up. 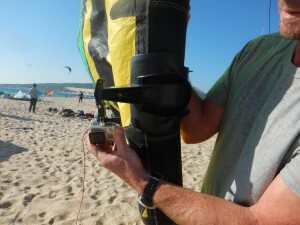 The Tracer Sky mount is designed to film to the outside of the kite. Filming the inside angle seems impossible since it will damage your kite. It does have a lot of freedom of positioning the angle from the outside, so it is still possible to get you (who is riding the kite with the mount) in the shot. Unfortunately there are two main disappointments from the Trace Sky mount; It will always be on one side of the kite (it can’t be fitted in the middle) and you will definitely feel it. The kite will behave a bit like you have unequal kite lines and it will pull one side more than the other. This is another reason (next to the angle of the mount to the outside) the one that is riding with the mount is probably not the person who will be the main subject of the camera. In other words you probably are the camera man and not the stunt man. First time usage: glueing patches takes quite some time. The second disappointment is that once you have set it up for a kite it will not be possible to set it at a bigger kite in the same set up. This is due to the fact you glue a couple of patches on the mount which can’t be removed and reused. So you set up a size for a certain kite (depending on the tube) and the mount is designed more or less to be used for this kite only. On top of that you have to realise 50% of the time you won’t be filming anybody, since the mount will be just facing the right direction at one tack. 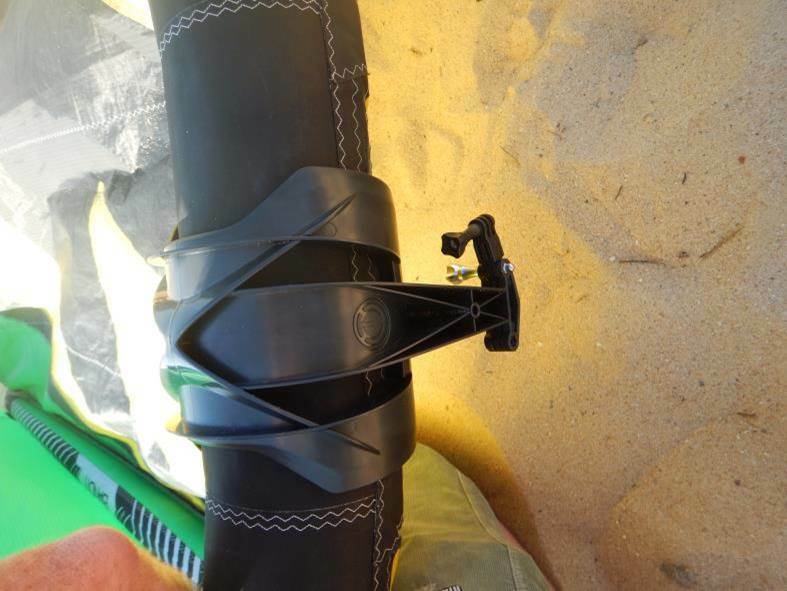 So when setting up the mount think about it a minute in which direction (best with the sun light and for a good trick heading in the waves for example) you want to aim the camera. 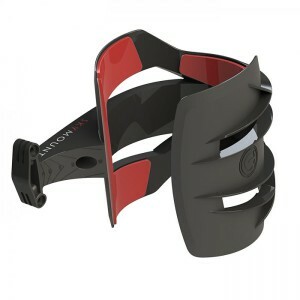 Once set to the right sized with the patches the mount is quite easily placed on the leading edge. 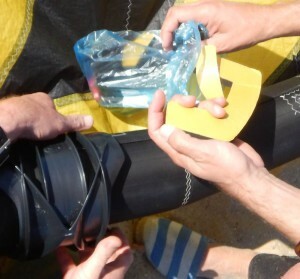 Either by sliding it side wise or even better to put it in place before the last few litres of air are pumped inside the kite. 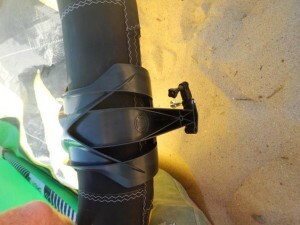 We do advise to put a leash on it attached to your kite (pump hook for example). There is a danger of losing it all when the kite deflates. Before getting in detail there are some general statements which should be taken into account before buying a kite mount, independent of which mount used. 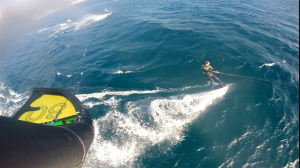 Filming from a kite means the camera’s view is depending on the movement of the kite. With little wind and/or underpowered situations the kite will move much more than with a bigger (overpowered) kite. So for a more steady shot it is wise to take a slightly bigger kite than usual. It will also influence the option to either set the cam on filming or shooting photo’s. If the intention is to film yourself it would be better to use a line mount instead of a kite mount. This depends a bit on the possible zoom options on the cam, but most action camera’s won’t have a optical zoom option. A kite mount does deliver better views on the surrounding than a line mount. 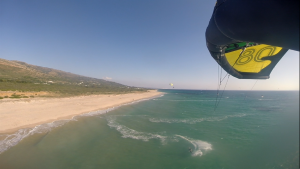 For filming your friends (in stead of yourself) a kite mount can be seen as an alternative to having somebody on the beach with a (big) camera or a drone. A kite mount will give you the opportunity to set a special point of view, but it does need a high degree of kite skills and communication with the one who wants to be filmed to avoid kite collisions. It will also need a couple of runs of testing the correct angle of the cam in the mount. Don’t underestimate the (extra) time this will cost, since you will need to go back to the beach, land the kite and reset the cam or mount’s angle. Yes there is an option with Velcro removable straps. Hi, i want to use it to film others riding or film from above the spot, someone who Sup’s etc but i want to be able to use it with different kites. My kite kite for example has very thin leading edge,free race kite but i want to able to use it with a wave kite fat leading edge ,profile. Is it an option or it wont work?